Tag line: "Don't Lose Your Head"
I’ve always enjoyed Washington Irving’s The Legend of Sleepy Hollow, a short story first published in 1820 that tells the tale of schoolteacher Ichabod Crane and his run-in with the Headless Horseman (a former Hessian soldier who had his noggin blown off by a cannonball during the American Revolutionary War, the Horseman now rides nightly, searching for his head). Over the years, several filmmakers have attempted to bring this story to the big screen, ranging from Walt Disney (1949’s The Adventures of Ichabod and Mr. Toad) to Tim Burton (Sleepy Hollow). 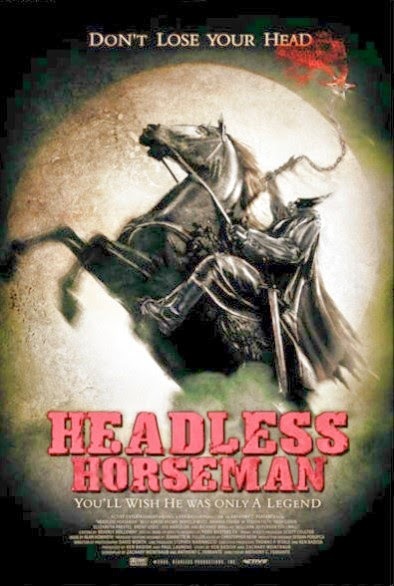 As for 2007’s Headless Horseman, a movie directed by Anthony C. Ferrante, it’s related to Irving’s classic tale in name only, telling an entirely different story, and doing so very, very badly. Following a brief flashback to 1862, in which two Confederate soldiers have an unfortunate run-in with the Horseman, we jump ahead 150 years and join seven friends: Nash, (Brett Lydic), Liam (Billy Aaron Brown), Tiffany (Arianne Fraser), Ava, (Rebecca Mozo), Lizzie (Trish Coren), Doc, (Joe Hartzler) and Seth (Elvin Dandel) , who, while on their way to a party, get a flat tire, stranding them in the backward town of Wormwood Ridge. But as they'll soon discover, Wormwood Ridge is no ordinary place, and this is no ordinary day. According to local hottie Candy (Lizzie Prestel), the town holds a ritual every seven years, inviting the Horseman to return and claim seven new heads. If he fails to do so, both he and Wormwood Ridge will cease to exist. Now, with only an ancient book to guide them, the friends must work together to find the sacred sword, a weapon that, according to the legend, will help them end this nightmare once and for all. Good Lord, where to begin? For one, Headless Horseman has some of the worst dialogue I’ve ever heard (in jest, one character says to another “You should know…. You’re dating your mom”, to which the other character replies “I am not dating my mom”. Yeah, that's the level of sharp, witty banter you can expect to hear through much of the film). The effects are also pathetic (one scene, where the Horseman throws a character against a wall of hooks, is a serious contender for the lousiest bit of CGI ever committed to film), and the movie is devoid of any real tension; even the Horseman’s attacks are boring to watch. If you’re in the mood for a movie about the Headless Horseman, steer clear of this mess and watch Burton’s Sleepy Hollow instead.